Home Get involved Raise money for Viva! Viva! relies on donations to keep fighting for animals, fundraising events are vital to our work! There are lots of ways you can raise money for Viva!. You can raise money for a specific campaign or for Viva! in general. Raise money to save animal lives! Do it by yourself or why not get together with some friends and hold a sponsored event. For example, a sponsored silence, or sponsored walk, run, swim or bike ride! We can send you the sponsorship forms to get filled in and promote your event to all our supporters to help you reach your goal! Gwen Stanbrook, 15, (left) did a 50km, 3 country bike ride and raised an incredible £435 for Viva! - smashing her goal of £200! The Viva! 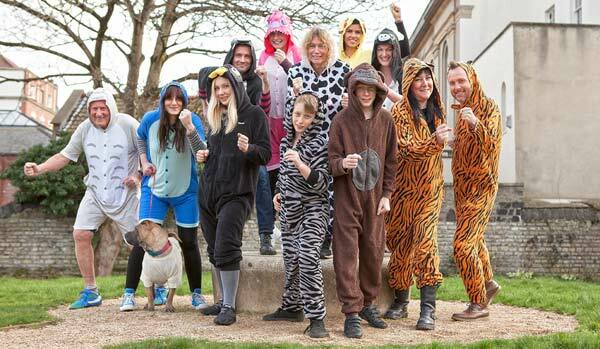 staff (right) did a sponsored run in silly onesies and raised £5,000! If you’re in a band, or have friends who are - why not organise a gig to raise money for Viva!. A percentage of the entrance fee could be donated to Viva! or you could have people asking for donations as people are leaving the venue. Another great thing about benefit gigs is that you can use the opportunity to raise awareness of the issues, Viva! can send you as many leaflets/posters as you need for an event! You and your friends could get together and bake some delicious cakes to sell! This is a great way of raising money because people love yummy cakes! It doesn’t have to be a bake sale; you could sell unwanted toys or anything you can think of! And if you're in need of delicious cake recipes, head over to the Vegan Recipe Club's dessert section, where you're bound to find something that will sell like hot cakes (pun intended!). You can donate all your broken and unwanted jewellery to raise funds for Viva!. If you have any gold, silver, odd earings, broken chains, costume jewellery and watches, you cn recycle them at no cost to you whilst making money for Viva! - pretty nifty eh!